" Victoria wrote: "Praying for return of Atticus Owen and the doggies! Please drop like another 7 book commitment.. promise ill buy all and narration by Victoria wrote: "Praying for return of Atticus Owen and the doggies! Please drop like another 7 book commitment.. promise ill buy all and narration by Luke!" The Oberon novella is a return of sorts. :) And after that, yeah, I have a new series coming in the same universe. ...more "
" Matej wrote: "thanks for the explanation... i have done my preordering duty =)"
" Lou wrote: "Hey Kevin. Are you ever coming to Detroit, MI?" STAKED—sorry I miss Lou wrote: "Hey Kevin. Are you ever coming to Detroit, MI?" STAKED—sorry I missed you! ...more "
Kevin Hearne voted for Sleeping Giants (Themis Files, #1) as Best Science Fiction in the Final Round of the 2016 Goodreads Choice Awards.
" Veronika wrote: "Kevin, you are of Irish origin (do you have any Irish ancestor)? Or why the Irish druid as main hero? I'm Irish but Veronika wrote: "Kevin, you are of Irish origin (do you have any Irish ancestor)? Or why the Irish druid as main hero? I'm Irish but also a bunch of other UK stuff. From a practical, historical standpoint, the Irish Druids were the only ones that didn't have to worry about the Romans, so the most likely survivor of that time would have been Irish. Plus I felt that the Irish pantheon didn't get much attention in fiction beyond the Morrigan. ...more "
" Brandon wrote: "I preorder your wonderful books via Audible.com Does that count?" It certainly does. As mentioned above, it's all good! Thanks so much! " Atticus O’Sullivan is the last of the Iron Druids. As an Iron Druid he is more or less a wizard, charged with the protection of the Earth. In Hounded, Atticus and his hilarious dog Oberon (who chats with him through a telepathic link only they share) ally themselves with and oppose both gods and witches in a very action packed saga where Atticus has a knack for getting into trouble even as he is escaping it. My favorite part of these books is the imaginative characters and the witty remarks Oberon makes. My least favorite is that it can be so action packed . That should be a good thing but my mind starts to wander after so many battles. If I catch my mind doing that and redirect it back however, I find that I was missing out on some pretty awesome stuff. The narrator and voice of Atticus in the audio book, Luke Daniels, is a perfect fit. If you like fantasy battles in a Lord of The Rings style but with a humorous twist, you will adore these books. I hope someday they make a movie out of one of these books, I think it would be a hit! 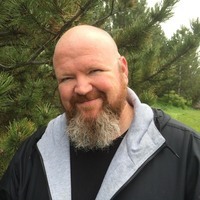 Since the newest Star Wars just came out, I feel I should mention that author Kevin Hearne has also written a Star Wars book called Heir to the Jedi. I haven't read that one, but hey if thats your thing maybe you should check it out. I have however, read all the Iron Druid chronicles as far as they have been published first on kindle, have the newest on pre-order, and am re- reading them now on audible. So yeah, I'm a fan. So sorry to see the last Holy Taco Church newsletter. I had a great time reading them and discovering new authors. Looking forward to your next venture with good ol' Oberon, and the audio release of the next Iron Druid -- the pre-order is all I want for Christmas!! Hello from Spain XD, thaks for the friendship, for writing the Iron Druid Chronicles and started me in Urban Fantasy!! I just wanted to tell your books are the best and perfect books within the Urban Fantasy world; I think I shall never find an Urban Fantasy book with this perfection. Hello from Australia Kevin ! I have red all your books bar the latest one in very quick time. Love them ! I read somewhere (and i could be mistaken) that you're not a fulltime author, that you work as a teacher or the like. Please stop & write more !! Thank you for the friending me. I'm almost done with Hounded and really enjoying it. I'm looking forward on finishing it and starting the next. The Trapped cover looks amazing. Thanks for friending me! I have been listening to the Iron Druid Chronicles on audiobook- and the mix between your sense of humor and Luke Daniels' narration is keeping me in stitches! It's been a long time since an author has made me laugh so much- so thank you! Keep up the good work! Have a great day & Happy Reading! I've been reading an awful lot of urban fantasy this last year, and I wanted you to know your series is my absolute favorite. The sense of humor, literary & pop culture references, Oberon, the different pantheons all wrapped up in a tidy and exciting plot with engaging characters... oh, I can't wait for the next ones! Thank you! Thanks for accepting. I'm finishing off "Hammered" as we speak. The relationship between Atticus and Oberon is possibly my favourite aspect of your books. Oh, and I'll cry like a baby if anything ever happens to Oberon. Hi Kevin. Thanks for accepting my friendvite. I am looking forward to reading your books. I love urban fantasy! Thank you for accepting my friendship request. I have only now learned about your books which will be released next year. They look really interesting and I seriously cannot wait to read..."
Thanks, Shy! I hope you enjoy them! Always good to meet a fellow bibliophile!